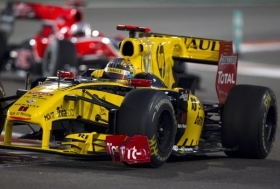 Renault has sold its remaining stake in its F1 team to private investment firm Genii Capital. LONDON (Reuters) -- Renault SA has sold its remaining stake in its Formula One team to Luxembourg-based private investment firm Genii Capital, which is already the team's majority shareholder. The Renault F1 team will race as Lotus Renault GP next year under a long-term partnership with Malaysian-owned sports car company Group Lotus plc, the companies announced on Wednesday. "Group Lotus plc will subsequently become a major equity partner in Lotus Renault GP, which it will co-own with Genii Capital," the team said in a statement. Confusingly, unless there is a further name change by their opponents, Lotus Renault will be competing against the existing Team Lotus -- also Malaysian-owned and also powered by Renault engines. Both plan to race in new black-and-gold liveries harking back to the glory days of the late 1970s when Colin Chapman's original Lotus team was winning races and championships. Team Lotus, which made its debut this year as Lotus Racing and is owned by aviation entrepreneur Tony Fernandes, is at odds with the Lotus Group owned by carmaker Proton in a battle over the use of the brand. Fernandes claims the rights to Chapman's Team Lotus name, which has been kept separate from the car company of late. The dispute is currently heading for the High Court in London, although the new season will be well under way before any hearing. "We're well aware that there has been a lot of controversy around the usage of our brand in F1 and I'm delighted to be able to formally clarify our position once and for all: We are Lotus and we are back," Lotus Group CEO Dany Bahar said. Genii said the announcement was part of a strategic alliance between the two companies "that will provide Group Lotus with significant technological and commercial opportunities for its range of road cars. "Following the return of the Lotus name to Formula One in 2010, under license from Group Lotus, this historic announcement marks the complete return of the Lotus manufacturer to the sport, with the full backing of its parent company Proton," it added. The title sponsorship agreement will run until the end of the 2017 season and Renault will continue to supply engines, technology and engineering expertise. "We will continue to enjoy a strong relationship with Renault over the coming seasons," said Renault F1 Chairman Gerard Lopez. Renault F1, with Poland's Robert Kubica partnering Russian Vitaly Petrov driving, finished fifth in this year's constructors championship.